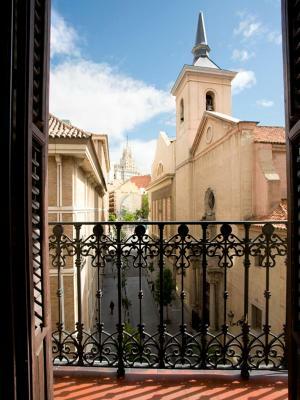 Lock in a great price for Petit Palace Preciados – rated 8.5 by recent guests! The staff and the service were great. Especially Amelie :-) They even prepared a birthday gift for my daughter’s birthday. A perfect location. Excellent location and very professiona lpersonel. Special thanks to Ray & Amelie for taking care of us and making our stay in Madrid very pleasant. Very safe area and located in the center of the city which is a plus. Great location, a bit noisy at times, but close to everything. Location is great and the room and WC are big enough and fairly clean. Great atmosphere and pleasant staff. 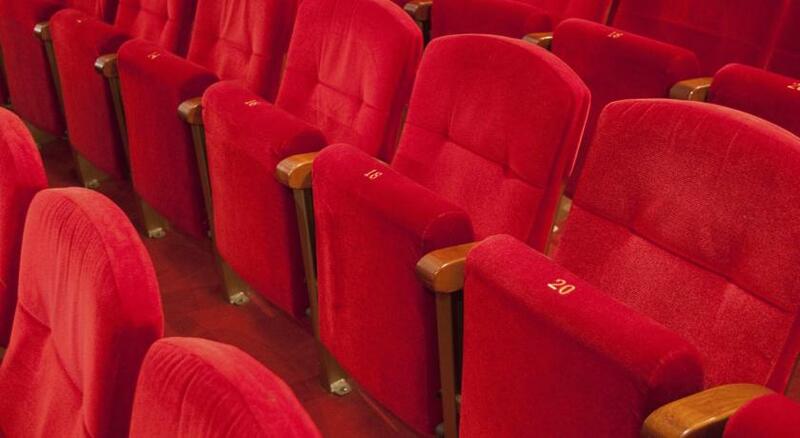 They would go out of their way to accommodate any request or any need. They do it with the smile and with effectiveness. Pilar, Thalía, Amelie and Sergio were so nice! I truly recommend this hotel in every respect. Location, staff, breakfast. All of it. Location was very central - close to shopping, metro, bars/restaurants etc. Staff were friendly & helpful. We paid extra for a larger room & felt it was value for money. Very central location. 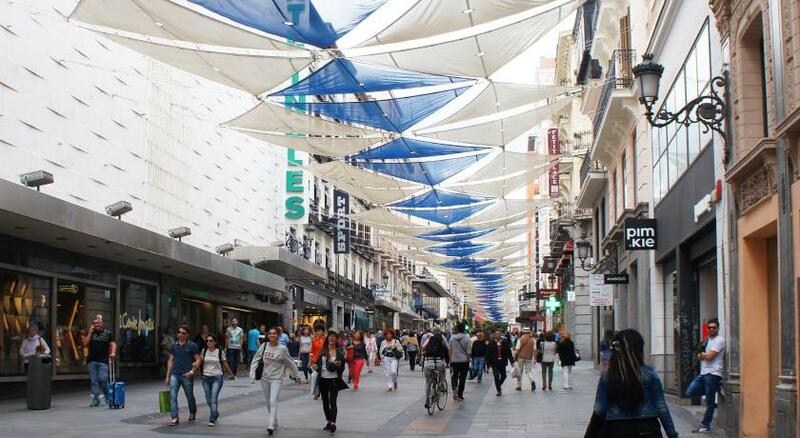 It is located at the very heart of the shopping district which means that everything is within reach - shopping centers, restaurants, fast food, interesting places. 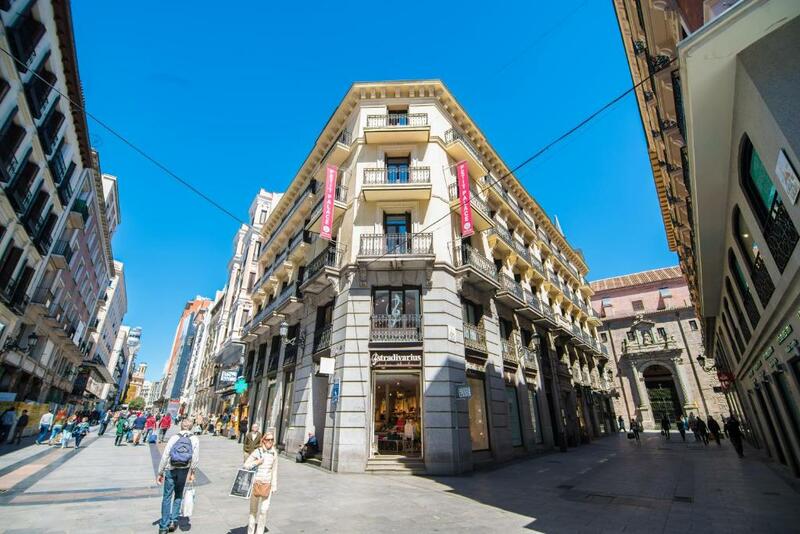 It is between Plaze del Sol and Callao and Plaza Mayor and Mercado San Miguel is also within walking distance. You feel safe to go back to hotel anytime even at night because the street is well lit, and crowded place. There's a big grocery under FNAC (behind the hotel) and at El Corte (across the street). 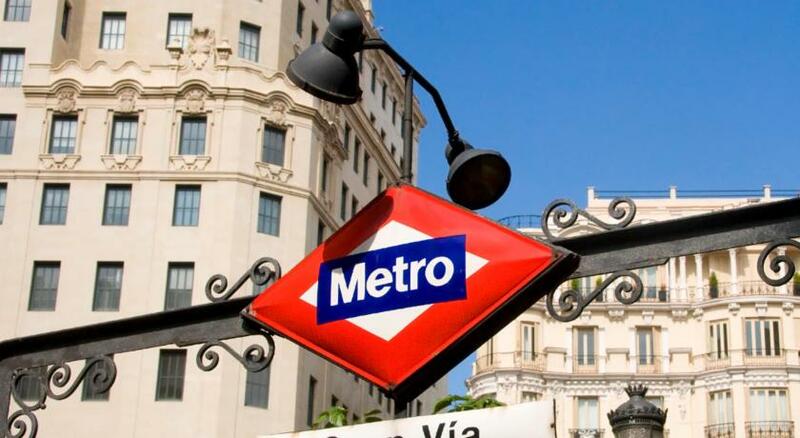 The closest metro are in Callao and Sol which are less than 5 mins walk away. The beds are comfortable. The kids love the bunk bed. Simple breakfast spread (pastries, hams, eggs, fruits, cereals, coffee, juices). 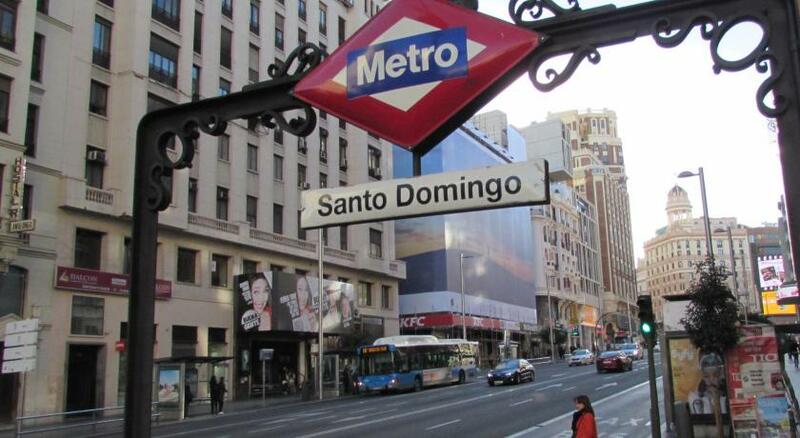 The location is in the middle of the city and it was so easy to just walk to the metro or any sightseeing location. The staff was amazing. We went to celebrate my sister's birthday so right after check-in they gave us a bottle of champagne and some cupcakes to celebrate! We had a wonderful time and I am looking forward to going back! 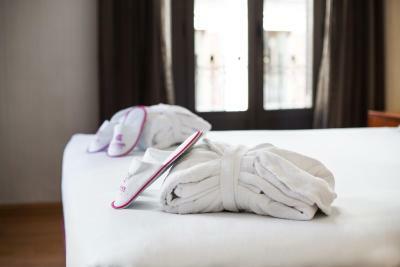 Petit Palace Preciados This rating is a reflection of how the property compares to the industry standard when it comes to price, facilities and services available. It's based on a self-evaluation by the property. Use this rating to help choose your stay! 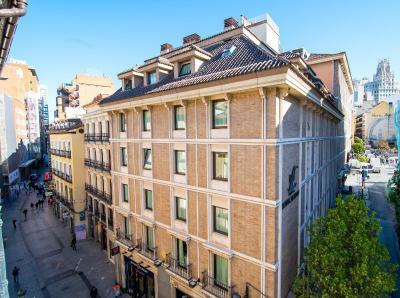 One of our top picks in Madrid.Petit Palace Preciados is located 800 feet from the famous Gran Vía Avenue. Rooms include a flat-screen TV. Free iPads with free WiFi are available upon request and subject to availability. 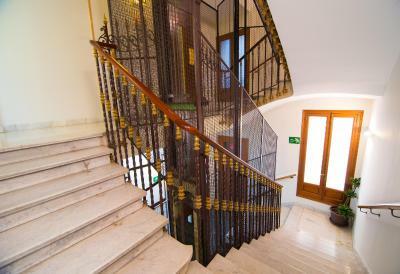 The Petit Palace Preciados features contemporary décor and wooden floors. A buffet breakfast is served in the 5th-floor dining area. During the summer guests can also enjoy breakfast outside on the terrace. 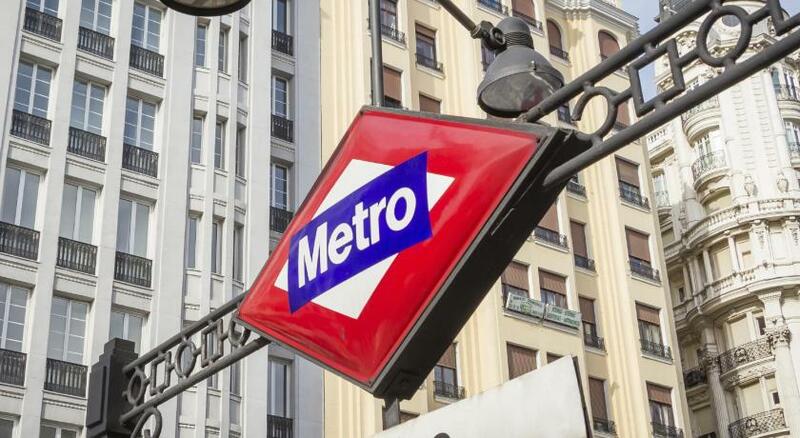 Sol, Callao and Gran Vía Metro Stations are within 5 minutes' walk of the Petit Palace. Discounts on nearby parking facilities are also available. 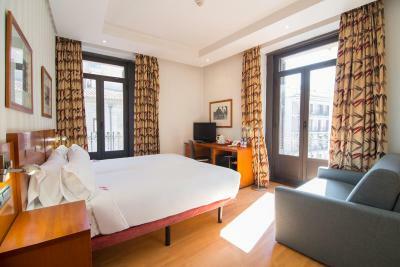 Petit Palace Preciados is just 2 minutes' walk from Puerta del Sol and Gran Via Avenue. 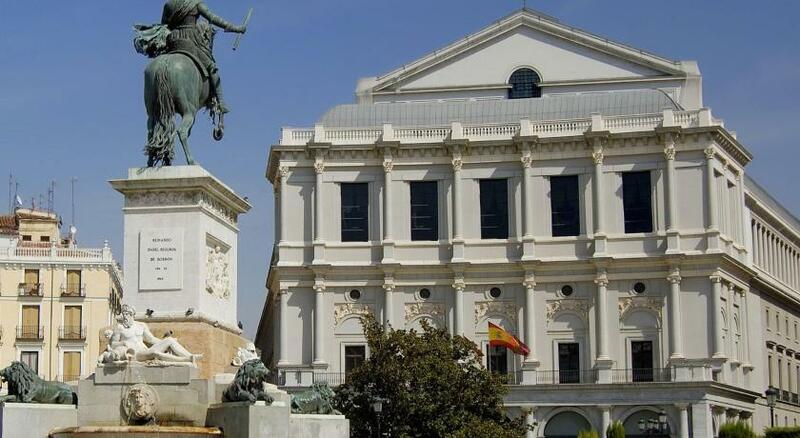 Both Plaza Mayor Square and the Royal Palace are less than 0.6 mi away. 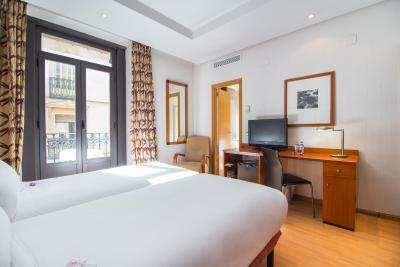 When would you like to stay at Petit Palace Preciados? 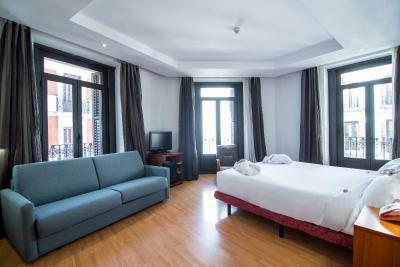 This modern, air-conditioned room includes a flat-screen TV and a bathroom with hydro-massage shower and hairdryer. A free iPad with free Wi-Fi is available upon previous request and subject to availability. This room has twin beds or a double bed (upon request). Any children staying will receive a special gift, subject to availability. This room has interior views and a double bed of 53 in. 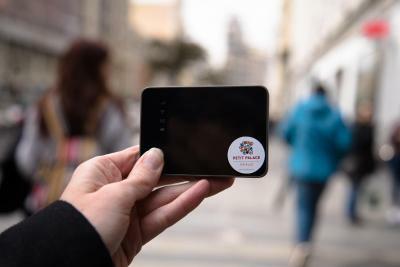 A free iPad with free WiFi is available upon previous request and subject to availability. 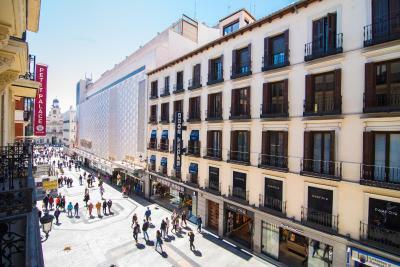 In the epiccentre of Preciados Street, you will be close to km 0 of Spain, and the main spots of the city. Disconect of the bustle of the city in bar roof. 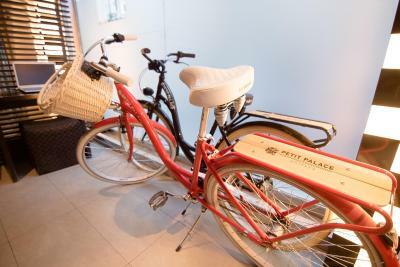 House Rules Petit Palace Preciados takes special requests – add in the next step! Petit Palace Preciados accepts these cards and reserves the right to temporarily hold an amount prior to arrival. Pets are permitted in Petit Palace Preciados free of charge, upon request. You can use the Special Requests box when booking or contact the property. Please note that the free iPads are upon previous request and are subject to availability. The shower door was broken, the position of the toilet bowl was too tight. The staff were excellent so helpful and nice, the breakfast was excellent a great choice, the location was great, the room was clean and comfortable. Shower was old. Noisy at night till early am with the dumptructs and the party people. The size of the room was very small, but when we booked we know that already. We accepted this as we were only staying for one night. However at check in they did give us an option to upgrade to a bigger room for only €20. The breakfast was served on the top floor of the building and the dining room is quite small, so at peak times I imagine it gets very busy. 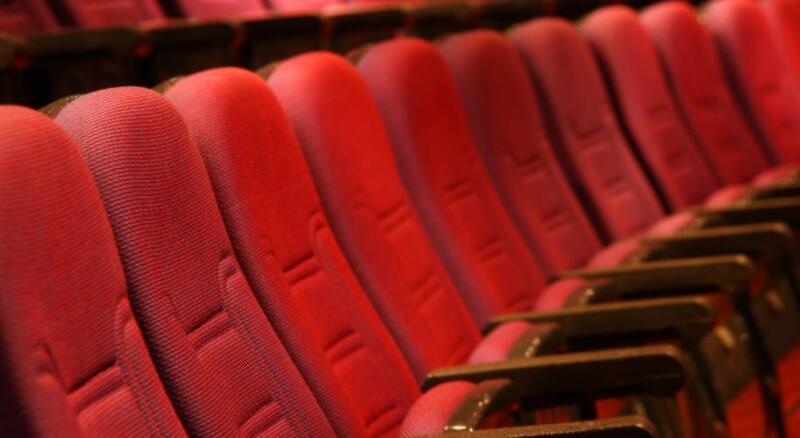 The selection was wide and varied, and good quality, so really enjoyed it. 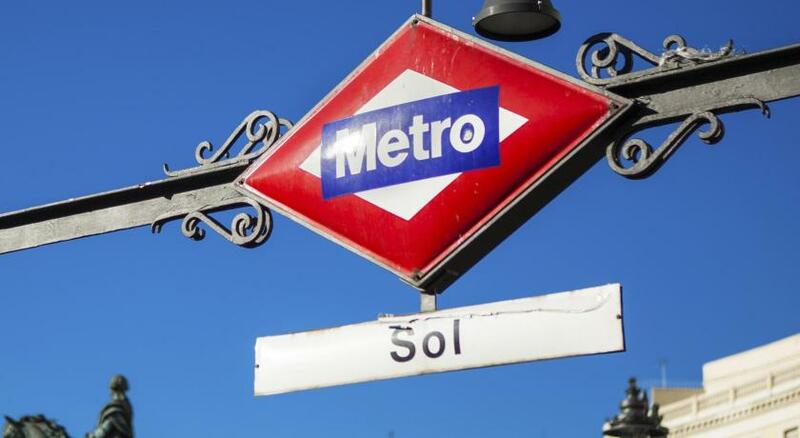 The central location of the hotel was brilliant, being less than 1 minute walk to Sol metro station. The reception forgot to book our cab which made us a bit late , but that isnt really their job and other than that they were great. Great hotel, really good location and staff were really helpful. 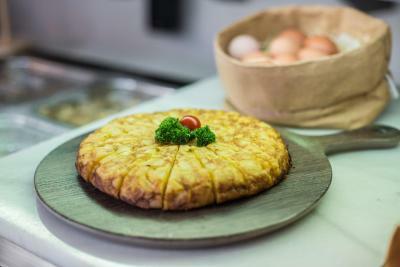 Restaurant to offer dinner since they only offer breakfast, but is easy enough to find great Tapas places to eat good and cheap food and drinks. We had a beautiful room with seveal balconies which were great by day but a little noisy by night (people noise only). 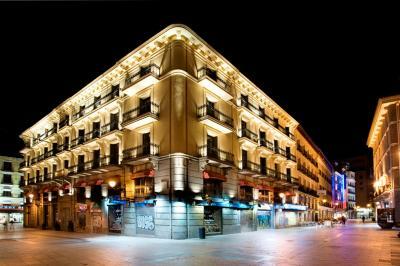 The location of the hotel was excellent and the staff extemely friendly and helpful. We were extremely impressed to recieve an email from the hotel about a week before arrival asking if we would like a transfer from the airport and also if there was any other thing the hotel could do to help with tours etc. Excellent service. Our room was a very large and comfortable and breakfast was wonderful. We would very happily stay here again should we return to Madrid. An outlet on both sides of bed would be nice. Breakfast is same same but good. Staff very accommodating. Nothing I didn’t like . Close to everything - church , shopping and transport. Very good value for money. I will stay here again. Lobby staff helped us in Madrid free walking tour. The rooms were too small for 2 people! The bathroom had a few broken things like the flush wasn't working well, the shower plastic cover could not close well, and there were not enough plugs in the wall to plug our devices. Also the electric door lock did not work, and it locked our things inside for a while! The location was the best I ever had in a capital I visited. It was near to almost everything. The breakfast was delicious and plenty! I loved the food and the good service. Excellent location. Very good breakfast. 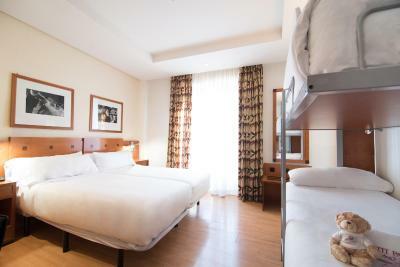 Clean and nice hotel. Bed is not comfortable, bathroom cabimet was broken. Very very small room. Old furniture. No water heater or Coffee or tea in the room. They asked for 20 € for kettle. İsolation of walls are very bad there are a lot of noise from other rooms. Everyday same breakfast with a limited food.